Calipso has been completely rebuilt from the steel hull up, all systems, interior and exterior space are new. The relaxing sundeck has lounge chairs and a jacuzzi. Boat's new dive deck has dry charging stations for cameras apart from the large camera table and a bi-level camera rinse tank for GoPros and big rigs. Each diver station has storage space below the seat. On the main deck, Calipso has a spacious open concept dining area and salon with large windows spanning both sides for views. The salon has a large TV for briefings, movies and sharing media as well as a small Galapagos library and plenty of outlets for laptops. 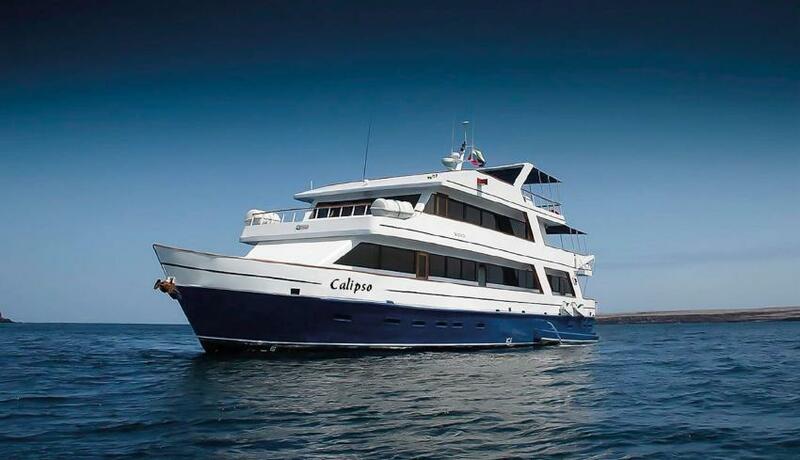 There are 10 cabins, however, Galapagos National Park regulations limit the number of divers onboard to 16. On the upper deck are 6 double cabins. The main deck has 2 double cabins. All cabins are convertible to 1 bed for couples and have large windows for views. 2 single cabins on the lower deck are assigned on a first come, first serve basis with no single supplement and have portholes for light. Each cabin has individual climate control, TV, safety deposit box, USB plugs and an ensuite bath with hairdryer. There is no carpeting on Calipso so anyone with allergy problems will not have irritants carpet can cause. Galapagos is a remote and advanced dive destination. Safety always comes first. The yacht is well equipped for any emergency with first aid, oxygen, AED, life jackets, life rafts, radar, VHF radio, EPIRB, satellite phone, GPS antenna, smoke detectors, smoke alarms, fire extinguishers, bilge pumps and emergency flares. For divers, dive alerts, SMBs and Nautilus Lifelines are provided. The new spacious and efficient 52 m2 dive deck has individual diver stations with storage, station assigned dive deck towels for hygienic standards, a large camera table with air, a bi-level rinse tank (shallow for GoPros; deep for big rigs), dry storage with charging stations, wetsuit storage, hot showers and a dive deck bath. Calipso has a new Bauer compressor. 32% Nitrox is available. Diving is done from Zodiac RIBs, called pangas in Galapagos. Each panga is equipped with a DAN oxygen kit and an ecological 4 stroke motor. Galapagos is a bucket list destination for divers, consistently rated as the top destination on the planet for pelagic species and a healthy marine environment. Swept by both the cold waters of Antarctica and warm currents from the tropical Pacific, the Galapagos is where polar meets tropical which is reflected in the marine life. The northern islands of Darwin and Wolf have the largest shark biomass in the world. Huge schools of hundreds of hammerheads, Galapagos sharks, silky sharks and whale sharks, in season, are the reason why. The western sites of Punta Vicente Roca, Cabo Douglas, and Cabo Marshall aren’t as sharks but are species-rich. Mantas are out west. Turtles and sea lions are everywhere. Punta Vicente Roca is a cleaning station for Mola Molas (Sunfish). Penguins (the northernmost in the world) are common out west and Cabo Douglas is one of the only places to see marine iguanas feeding underwater. Add eagle rays, stingrays, large schools of jacks and barracudas, free swimming morays, sea stars, nudibranchs, many species of tropical fish, weird critters like the red-lipped batfish and the relatively common sightings of orcas and it’s easy to understand why Galapagos is Mecca for divers. Above the water, you can expect to see land-before-time vistas, active volcanoes, blue footed boobies, red footed boobies, flightless cormorants and more. We have added a dive site to our itinerary that is not on any other itinerary, Marchena. For years, only scientists and filmmakers have been allowed to dive here. Sightings include massive numbers of rays and dolphins in addition to sharks and tropical species. High season is June - December when the polar Humboldt current brings its abundance of nutrients to Galapagos and the massive, pregnant whale sharks migrate through. Currents can be strong, seas choppy and visibility diminished at this time of year. Whale sharks are traditionally most abundant in August, September & October, however, the last few years have seen earlier arrivals and departures. Air temps are cooler and the sky is often cloudy, so jackets or sweatshirts are often needed. Low season is January - May when seas are calmer, water temperatures are warmer and visibility is better. No whale sharks, but all other sharks and marine life are still present. Feb & March are the warmest months of the year. You won’t need a jacket and will appreciate the AC inside Calipso. Galapagos waters are cool even though the archipelago straddles the equator. Cold water currents and upwellings can produce thermoclines as low as 13C /54°F although the average surface temperature is 21- 24C / 70-74° F, often warmer at Darwin. Western sites (Cabo Douglas, Punta Vicente Roca) and Cousins Rock have cooler water year round. Visibility can range from 5 - 30m / 16-100 ft. depending on the time of year and dive site.